Cognitive Decline with Age — Inevitable or Preventable? In 1947, 70,000 Scottish school children completed a national intelligence test. Fifty-six years later, 1000 people in the Scottish Lothian region who took part were re-tested, providing a unique look at the impact of early intelligence on cognitive function in older age. Researchers wanted to answer the elusive question: Why do some people stay sharp as they age, while others lose their edge? Cognitive impairment and dementia in late life have become major societal burdens. 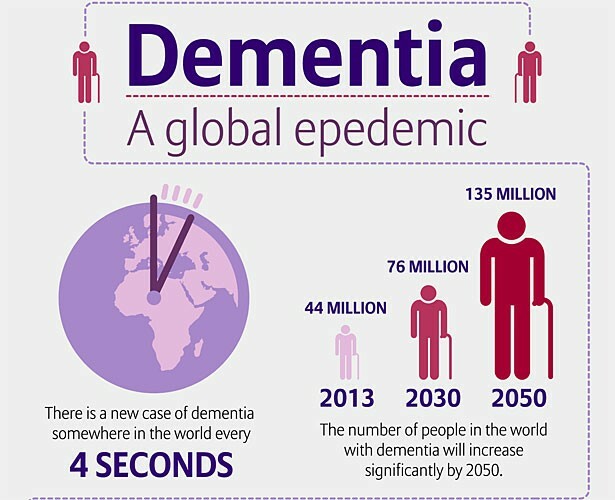 Current estimates are that 35.6 million people live with dementia worldwide, with a new case diagnosed every four seconds. Dementia affects memory, behavior, thoughts and ability to live independently  impacting not only affected individuals, but families, caregivers, healthcare providers and national economies. At a time where aging populations threaten to inundate already over-burdened healthcare systems, we need solutions, and fast. The urgency has been recognized by the World Economic Forum and its Global Agenda Council on Ageing, and just last week, the Lancet named dementia as one of the most overlooked and pressing health priorities of our time. The Lothian cohort study found that one factor strongly predicted late-life cognitive ability: level of intelligence, as measured by IQ, at age 11. However, researchers found this only accounted for 50% of the variance in IQ at age 77, meaning cognitive function in old age is not completely pre-determined. Additional factors included tobacco use, blood pressure control and bilingualism! While research into the prevention of dementia is its infancy, it is clear that addressing underlying lifestyle-related risks has the potential to slow or prevent cognitive decline. Results of the FINGER (Finnish Geriatric Intervention Study to Prevent Cognitive Impairment and Disability) study, published this month, show those at-risk of cognitive decline can improve cognition by 25% through improved diets, regular exercise, cognitive training, and managing vascular risks such as high body mass index (BMI) and blood pressure. Miia Kivipelto, lead FINGER researcher, commented at the recent New York Academy of Science Nutrition in Dementia conference that psychosocial benefits of group exercise classes were likely one of the keys to the interventions success. Healthy aging means remembering to care for mind and body. Experts in the field find those who live healthier lifestyles, staying cognitively active and socially connected throughout their lives, are less likely to suffer cognitive decline in old age. The ancient Romans were right: mens sana in corpore sano. What can you do to help your parents age better, and to make sure you live out your golden years to the full? Its never too early, or late, to act.